Are you looking to build your own shipping container house? If you are, there are some financial implications you might not be aware of that we have just discovered the hard way. Finance for shipping container homes is hard to come by in South Africa. I’ve recently realized that we’ve been working on the shipping container house project for almost a year! It doesn’t look like much yet but we’ve actually accomplished quite a bit. When we began the project, we knew that costs were going to go up so we did all we could to speed up the process so that we could start building as soon as possible. However, life had other plans and we encountered quite a few delays. This is to be expected, but unfortunately, expenses also increased at a rate higher than we expected. Kevin estimates that steel has increased by approximately 20-30% in the last year. An unexpected increase in the VAT rate earlier this year has also affected the price of everything. In short, the money we had set aside for the project is no longer going to cover what it would have originally. We always knew we would have to find some additional financial help for completing the shipping container house project. We were, from the beginning, expecting to have to extend our home loan in order to cover expenses, but by how much we weren’t sure. A few weeks ago we sent in all the paperwork for our loan extension. We had to send in the usual several months bank statements and lots of completed forms. Then the bank asked for more bank statements and more paperwork. We then had to take some time off work so that someone could be at home for the bank’s assessor to visit the property. After all that, we were refused the funds. Why? Although we passed all their affordability tests, banks in South Africa do not offer financing for shipping container homes. This we did not know. I can only hope that for everyone else out there, that with the growing popularity of this building method, the banks will soon come to realize that they are missing out on much business and that they will review their policies. In the meantime, we are making alternative arrangements in order to finance our project. We are looking at this as part of our adventure, and will still end up with the beautiful home we envision. 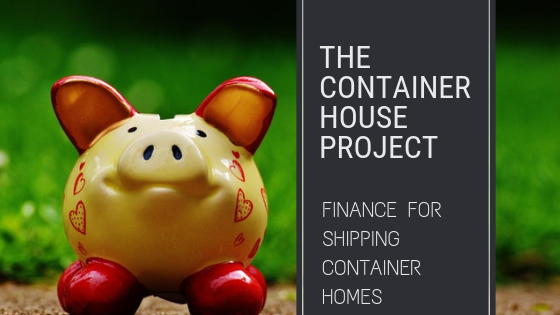 If you are planning your own shipping container project, or any other building project, and will need assistance with finance, we advise that you check with your bank as to their current policies and make sure to get their response in writing. Meanwhile, we are excitedly moving forward to the next phase of our project! Sounds like you are making good progress, Pity about the Bank though! Thanks, Alan. We feel that we are and looking forward to making even more progress in 2019!